All drive shafts are (greasable unless otherwise requested). 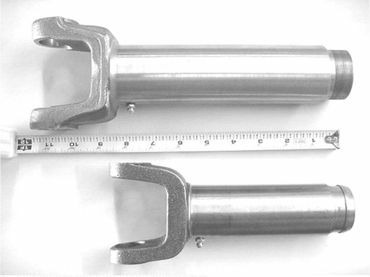 WHAT IS LONG TRAVEL-THIS IS THE LONG SPLINE FORGED YOKE THAT GIVES YOU 7 INCHES OF WORKING TRAVEL VERSUS 3.5 INCHES IN THE INDUSTRY. 1.5 INCHES DIAMETER 10.5 INCHES LONG. For lifted vehicle you will need a 3 ujoint drive shaft ot lower the angles and remove vibrations. Slip with CV Drive Shaft to remove vibrations to the increase of angles. We will workd with you to specify the yoke type and spec. .For higher angle and stronger CVs go to the generic custom drive shaft category. Please specify the Transfer Case or identify the yoke with specs. Instead of a slip yoke with a CV drive shaft, this kit offers a fixed yoke at the TC after drilling and tapping a hole at the end of the output shaft. The advantage of this is that you will be able to used the front drive shaft if the rear is disabled and if you need long travel you will be able to put that on the new style drive shaft. The Kit comes complete with 5 bolts and precision balanced. A BOLT-ON. FOR ALL TRANSFER CASE EXCEPT BW SLIP YOKE TYPE. For higher angle and Stonger CVs go to the generic custom drive shaft category. On a Dodge, Lifts greater than 8 inches require the bigger CVs with higher angles.